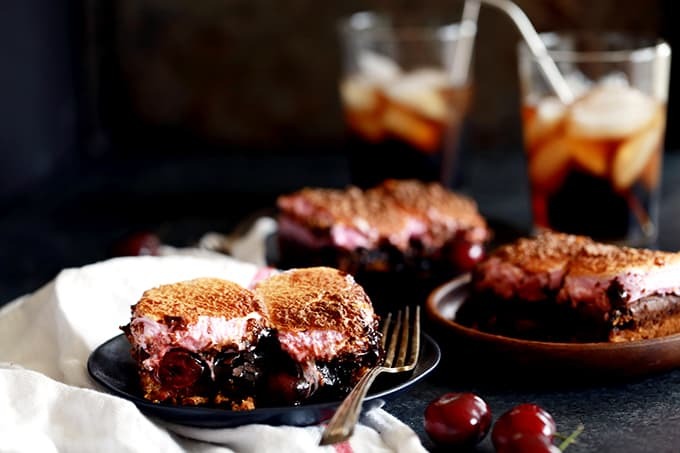 These Cherry Cola S’mores Brownies are the perfect dessert mashup. 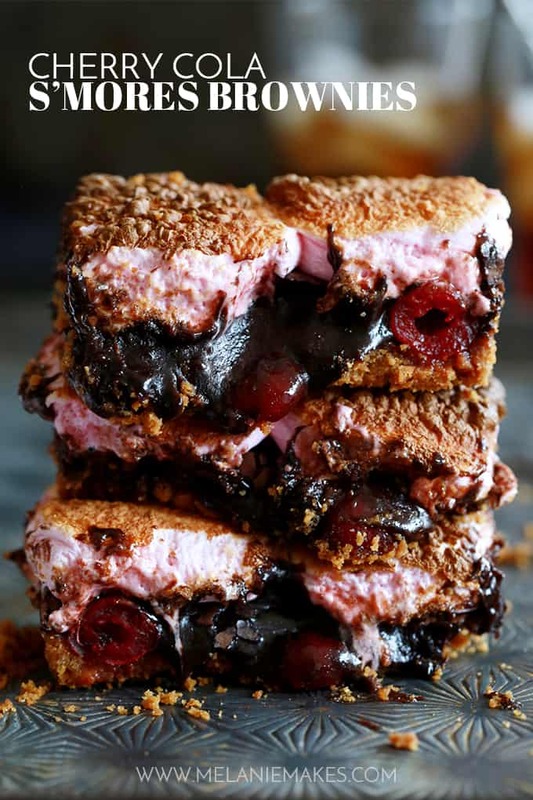 A buttery, graham cracker base is topped with a cherry cola spiked brownie batter, dark chocolate candy bars and maraschino cherries before being topped with a pillowy layer of cherry flavored marshmallows. They’re pretty much heaven in brownie form! This recipe was written in partnership with Campfire® Marshmallows. As always, all thoughts and opinions are my own. Thank you for supporting this brand that allows me the opportunity to create content for Melanie Makes. I can’t believe it. June is coming to a close and July is just around the corner. That means that the 4th of July holiday is also next week. But never fear the swiftly changing pages of the calendar, my friends! I’ve got the best holiday dessert ever. 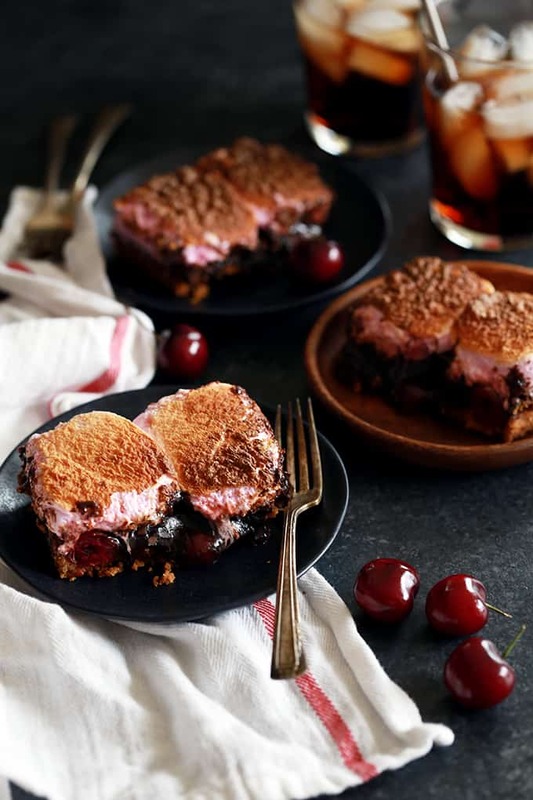 Granted, it’s an amazing dessert any day of the year, but these Cherry Cola S’mores Brownies are the perfect dessert mashup to easily feed a holiday crowd. 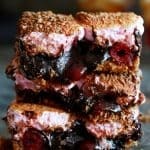 The inspiration behind these decadent Cherry Cola S’mores Brownies is none other than my super popular Peanut Butter Cup Stuffed S’mores Brownies. S’mores brownies plus my love of all things cherry cola and you’ve got one delicious desserts. And to be clear, I’m talking about the delicious fountain cherry cola that you can get at some restaurants that use the real syrup and come with a cherry in your glass. Those are the absolute best and totally worth the indulgence whenever you can find one. But back to the brownies! A buttery, graham cracker base is topped with a cherry cola spiked brownie batter, dark chocolate candy bars and maraschino cherries before being topped with a pillowy layer of cherry flavored marshmallows. They’re pretty much heaven in brownie form. The contrast in flavors and textures is so delicious that a pan of these brownies didn’t even last two days in our house. The cherry on top of these brownies – literally! 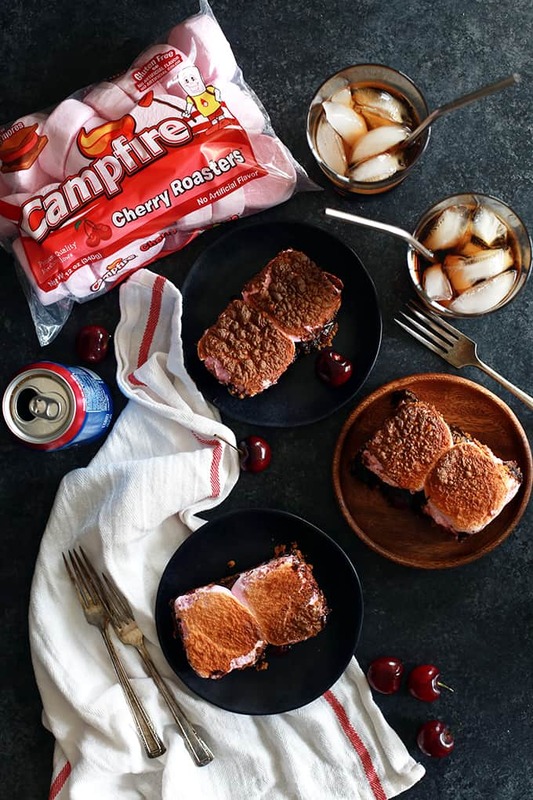 – are the Campfire® Cherry Roasters that create the signature marshmallow layer of these s’mores treats. This new flavor helps take your s’mores to the next level! 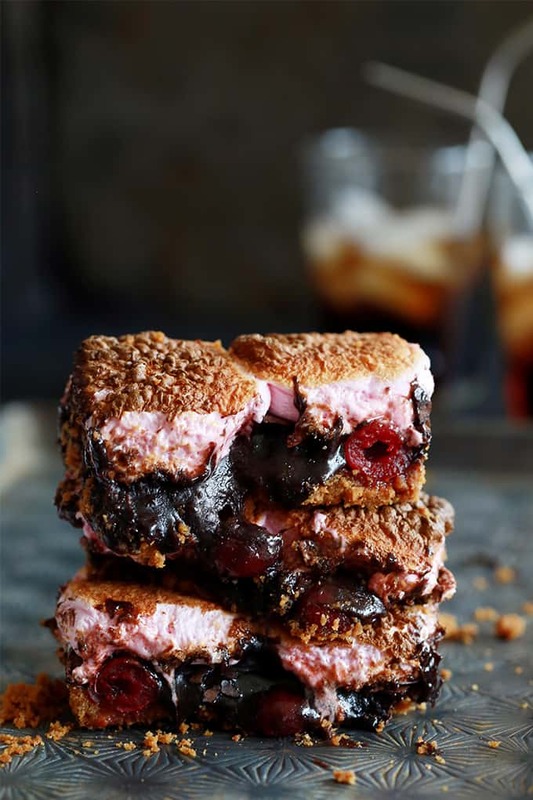 Bursting with bright cherry flavor, I love that these marshmallows are larger and flatter than a typical marshmallow which not only makes them perfect for traditional s’mores but they make a nice even layer for the top of these Cherry Cola S’mores Brownies as well. They also make it incredibly easy to cut the brownies into perfect portions as you simply cut around each brownie. Or if you’re like me, around TWO marshmallows because they’re so good you need the bigger brownie! I’d been wanting to get my hands on some Campfire® marshmallows for some time now and they definitely didn’t disappoint. I love that they have fun, festive marshmallows for every season. They’ve definitely earned themselves some valuable pantry real estate for future baking projects. In fact, I can’t wait to try them next in my grown up Angel Food Cake S’mores Skewers that have a wine spiked chocolate sauce and my out of this world Dulce de Leche Swirl S’mores Brownies. I’m also thinking they’d made a great substitute in my Double Chocolate No Bake S’mores Pie Yes, I realize I need to start a S’mores Anonymous group. In fact, at this point I have no doubt I’d be the president! Preheat oven to 350 degrees. Grease a 9x13 pan and set aside. In a medium bowl, stir together graham cracker crumbs, sugar, salt and butter until combined. Pour into prepared pan and press into an even layer. Bake for 12-14 minutes or until set and beginning to brown. In a mixing bowl, stir together brownie mix, cherry cola, vegetable oil, maraschino cherry juice and egg. Top graham cracker crust with brownie mixture, spreading in an even layer. Break each candy bar into four equal pieces and place onto brownie batter in three rows of five. Place maraschino cherries into six rows of four, in between chocolate bar pieces. Bake according to box directions, until just set. Remove brownies from oven and turn oven to broil setting. Add marshmallows to top of brownies pressing lightly to adhere them to the warm brownies. Broil for 2-3 minutes or until they reach desired char level. Let brownies cool completely before attempting to cut and serve. Marshmallows are an everyday sweet treat and a staple for favorite family recipes! From roasting over a campfire or cereal treats to snacking and crafts, Campfire® Marshmallows add a little fun to everyday life! I have no doubt that they’d be the perfect choice for this Mini S’mores Pie recipe, this creamy S’mores Dip, these easy S’mores Pudding Parfaits and this incredible S’mores Panini sandwich. Be sure to follow Campfire® on Facebook, Instagram and Pinterest to see more great S’mores recipes! Whoa!!! Hello delicious!! Where have cherry marshmallows been all my life?! Mouthwatering! These look so great! Yummy ???? What a fun idea! Looks delicious! What a great idea! No need for a campfire when you can make these at home. This is making me drool!! Definitely a must-make!! Brownies are a weakness of mine and these are topping the list right now! They definitely are a favorite of mine! Where have these been my whole life!! They look amazing!! Ok these look so fun!! I LOVE smores mashups. You just can't beat marshmallow. So good! Thanks, Karen - it's definitely a new favorite at our house! Hi there! I just came here to say that these s'mores look divine. I've never seen them so yummy like this before! I'm definitely going to try it this weekend. Can't wait! Thanks, Kelly! Let me know what you think if you give them a try! This sounds and looks AMAZING! Cherry Cola is the best too! My younger son (s'mores lover through and through) would go crazy for these! What a fun idea. Thanks so much, Dara - I'm betting your son would love these! I could eat those cherry marshmallows all on their own but WOW, these brownies look incredible! I must admit they are a delicious treat on their own, Valerie! And of course, they're on a whole other level in these brownies! Wow! This looks amazing. Love cherry cola and I gotta find those cherry marshmallows! Definitely put them on your grocery list, Maryanne! Whoa, that looks positively scrumptious!! Okay, these are actually incredible. Adding these to tomorrow's to-do list right now! Thank you so much, Karly - can't wait to hear what you think! This looks amazing. Those marshmallows are going on my grocery list today! Definitely find yourself some of those marshmallows, Dorothy - they're amazing! These brownies are just PERFECT! Seriously. Love them and cannot wait to make 'em for my fam! Thank you so much, Erin - they're definitely a new favorite at our house! Oh sweet jesus these look incredible. Best compliment ever - thank you! These look absolutely incredible! 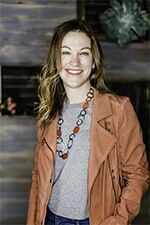 I definitely love these for a holiday party! Thanks, Jamie! These will definitely be making another appearance soon at our house since they keep disappearing so fast! Thanks so much, Em! I'm thinking you'd love these brownies just as much as I do!